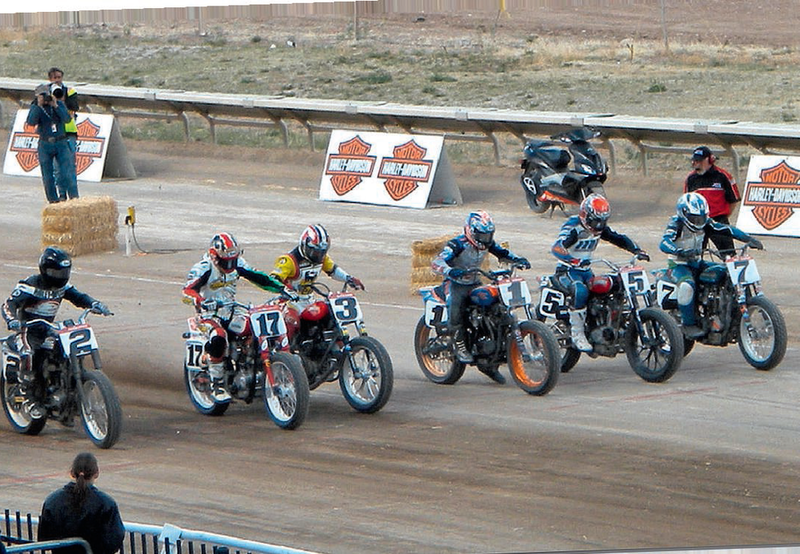 First we headed towards Prescott in Arizona to watch flat track racing on a mile long oval. The ride out took us along Interstate 10 East. I’ve heard it said that riding miles on a straight road through a desert wilderness must be boring but for me it was far from it. with palm trees and mobile homes in the middle of nowhere. 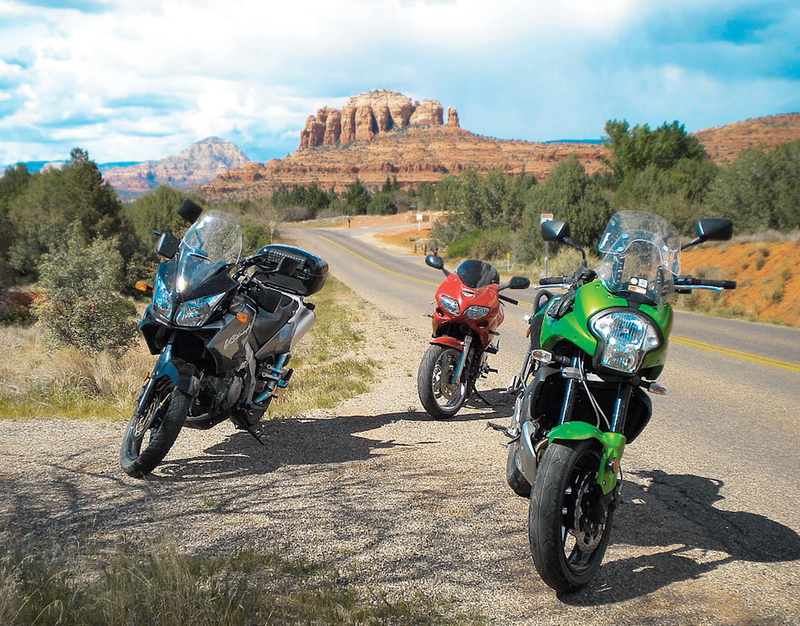 Arizona Highway 89, by contrast, provided a welcome change of riding and scenery. We rode through green fields, and lush forests as we climbed. Stopping only to fuel up, we weaved into the mountains towards Prescott. Next morning we rode to Yavapai Downs for the racing – I don’t think I’d been as excited about watching any form of motorcycle racing since my first visit to Oulton Park in 1965. This was to be something new, something different, something that I would rarely, if ever, get the chance to watch in Europe, especially on a long track and with the world’s top flat trackers racing. The crowd was fascinating. They weren’t the stereotyped Harleyriding, denim-clad, bearded bad boys that the media presents. OK, there were a few of them, but there were also bikes and riders that reflected the broad church that makes up the world of two wheels; from the latest Ducati to Triumphs, Guzzis to the expected collection of Japanese bikes as well as some Brit classics. Before the racing started I wandered round stalls when a small, wizened, elderly man wearing immaculate denims emblazoned with badges brushed past me. “That was Sonny Barger,” Tom whispered to me – I’d been brushed past by the founder of the Hell’s Angels. The racing was something to behold. Riders such as the legendary Chris Carr muscled beautiful, rasping Harleys round, backing them in and sliding them out like flyweight speedway machines. But the highlight was seeing the Harleys beaten for the first time in a top class national flat track race, by Joe Kopp on a Ducati – but then only by a tyre’s width. Kopp and the Ducati got a rapturous reception, though as one wag in the crowd shouted “You watch, betcha the AMA will change the rules again to make sure Harley wins next time!” Several months later, I read that that was exactly what had happened. The next morning we headed towards Flagstaff. Unlike many European bikers who fantasise about ‘getting their kicks on Route 66’ and imagining they are the modern day explorer, I did not have precisely the same feelings. For me the road mostly represented the plight of all those dispossessed farmers and labourers who, along with all their worldly possessions and family, made their way in battered trucks to California during the Great Depression of the 1930s, hoping for a better life. The 66 proved to us it could still bite. We were heading to Oatman, which marks the start of perhaps the most dangerous section of the old road, and one where many a migrant found their escape to the promise of California ending in a tangle of metal, broken bones and lost dreams. It was by now late afternoon; the sun was low in the sky, at points blinding us. I fell back from Tom and Dwayne, unable to maintain their pace. After a while, I saw Tom heading towards me to check I was ok. I gave him the thumbs up and continued, catching up with Dwayne. We waited for Tom. And waited. Dwayne rode back and sure enough Tom had come off on one of the bends. Thankfully, he had bounced on his bum pack and narrowly avoided a boulder the size of a car. Tom had many accidents in his racing career but this was very different – he was now 75, had artificial hips and knees and didn’t bounce. Luckily, he seemed ok. The appearance of Havasu City was enough to depress anyone after the wide open spaces and wilderness of parts of our ride. Garish, tacky, bright, it was an America I can usually deal with but after all that had happened I could not wait till the next morning when we got the hell out of the place. Still, there was the sight of London Bridge (bedecked in American and British flags) to take in as well as old British phone boxes, an old London bus and men dressed up as Beefeaters. It was about authentic as an American diner in the middle of Doncaster on a wet day in February. By now the effect and pain of the crash was beginning to sink in on Tom. Dwayne and I had to help him to climb onto his bike and this was to be repeated at every stop we made for the rest of that day. But as we made our way through Joshua Tree, Yucca Valley and Morongo Valley on a roller coaster of a road crowded with local traffic and heavy trucks it was clear the best roads were over. Like every major ride I’ve done, it wasn’t just an adventure, but an education and a feast of sublime images and experiences. After close to forty years of visiting, working in and touring the US, I still knew that I had much to learn.